China’s rainbow mountains are without a doubt the country’s best natural wonder. This breathtaking painted landscape stole my heart from the first time I saw a picture of it. Sitting in the living room of our house in small town USA, 7000 miles away from the mysterious Middle Kingdom we now call home, I did a Google search for “amazing places in China” and found the most incredible mountains I had ever seen. It was at this moment that I truly got excited about our pending move to China. 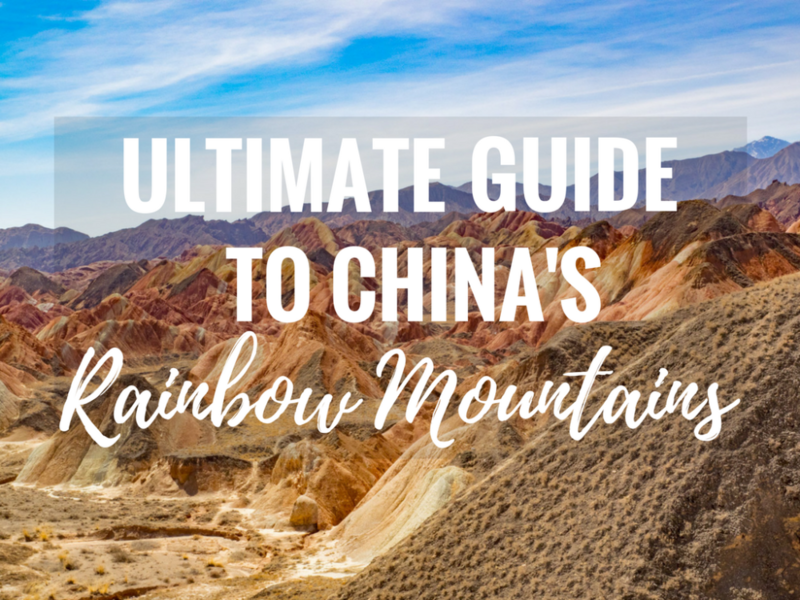 I had my heart set on seeing the rainbow mountains ever since that day, and after 2 years of living in China, we finally made it to the Zhangye Seven Colored Danxia National Geopark! Phew, that’s a long name, I’ll stick with Rainbow Mountains from now on. The breathtaking looks of the Rainbow Mountains are the result of the folding of oceanic crust, exposing layers of sand and mudstone and shaping them into the peaks and valleys seen today. Approximately 24 million years of natural erosion brought out the mountain’s distinct layers and brilliant colors. Seeing the mountains in person it almost looks as though someone came through with a giant can of spray paint and painted lines across the mountains. The fact that this is a natural formation is truly mind blowing. Standing face to face with one of Zhangye’s Danxia mountains it’s easy to see how erosion occurs. So easy in fact that I’m surprised there are any mountains left to look at today. Up close, you can see that the mountains are composed of nothing more that mud and rock. Just touching the side of a danxia mountain causes loose dirt and rocks to fall away. Warning – do not touch or walk on the land outside of the designated pathways and roads inside the geopark. The landscape is very fragile and needs to be preserved so that many future generations can come admire nature’s stunning painted mountains. 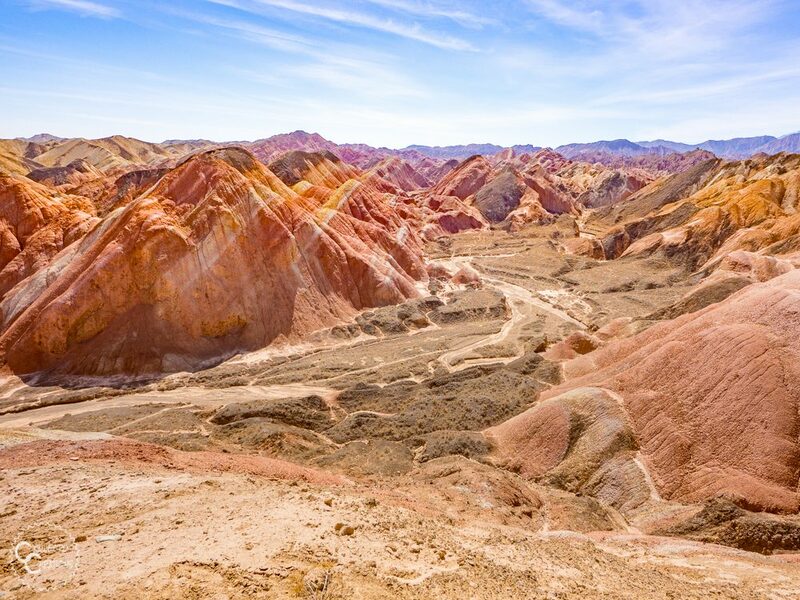 The Rainbow Mountains are located inside of the Zhangye Danxia National Geopark 张掖丹霞国家地质公园 , 30km west of Zhangye City, Gansu Province in northwestern China. 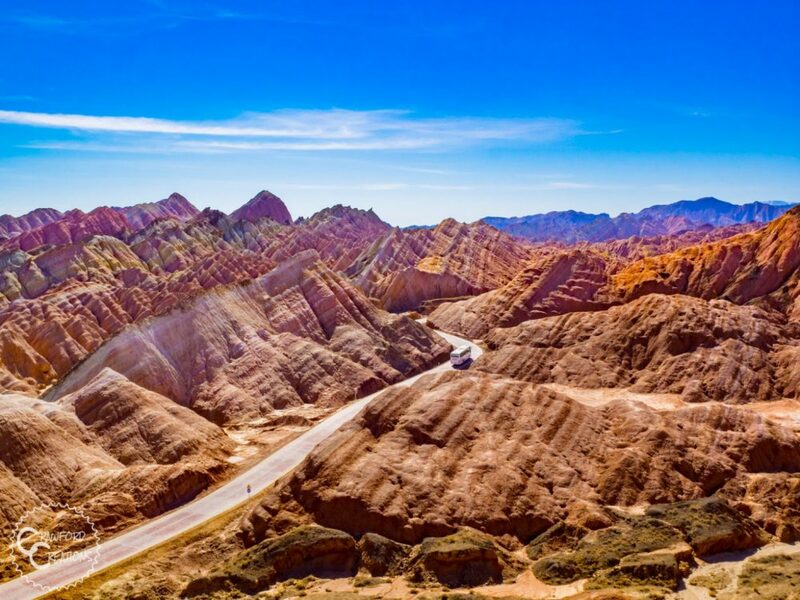 The park covers an area of 322 square kilometers and contains 2 separate Danxia regions: Seven Colored Mountains (rainbow mountains) 七彩丹霞 and Ice Valley (Bing Gou Danxia) 冰沟丹霞 each it’s own separate park. There are two different entrances to the Rainbow Mountains section of the geopark: the North and West gates. Tickets are purchased at the gates and include a ride on the park’s shuttle buses which transport tourists to each of the viewing platforms within the park. 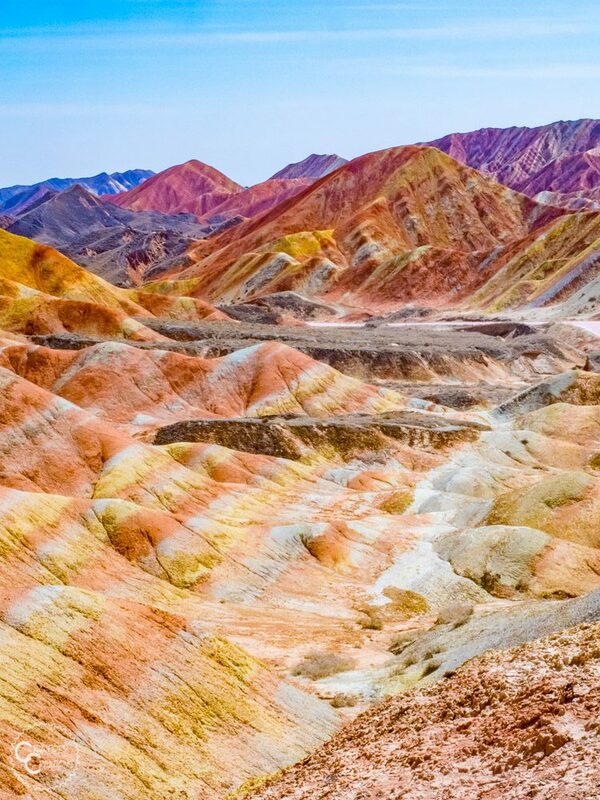 Your home base for exploring the Rainbow Mountains is the city of Zhangye in Gansu province. 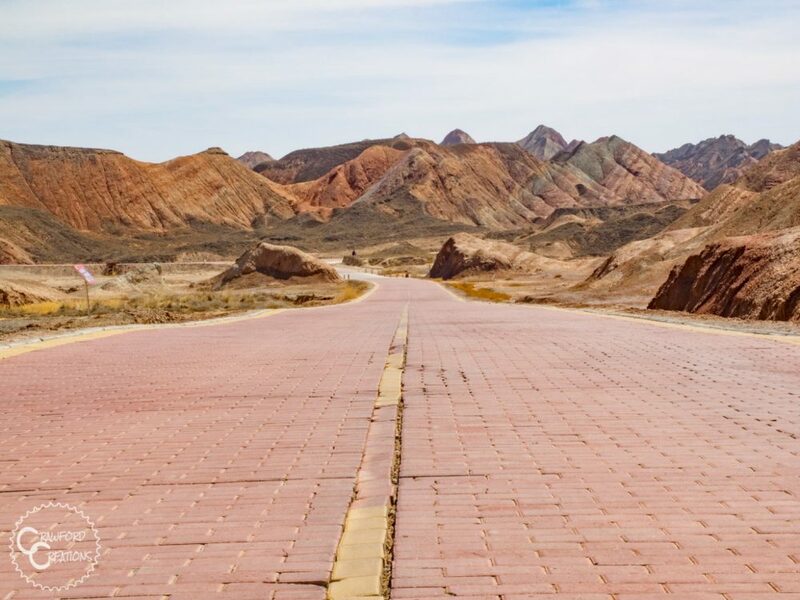 Zhangye is a little bit off the beaten path to get to so you’ll most likely have to take multiple forms of transportation just to get to the city. Zhangye does have an airport, but it’s tiny and extremely difficult to find a flight there. 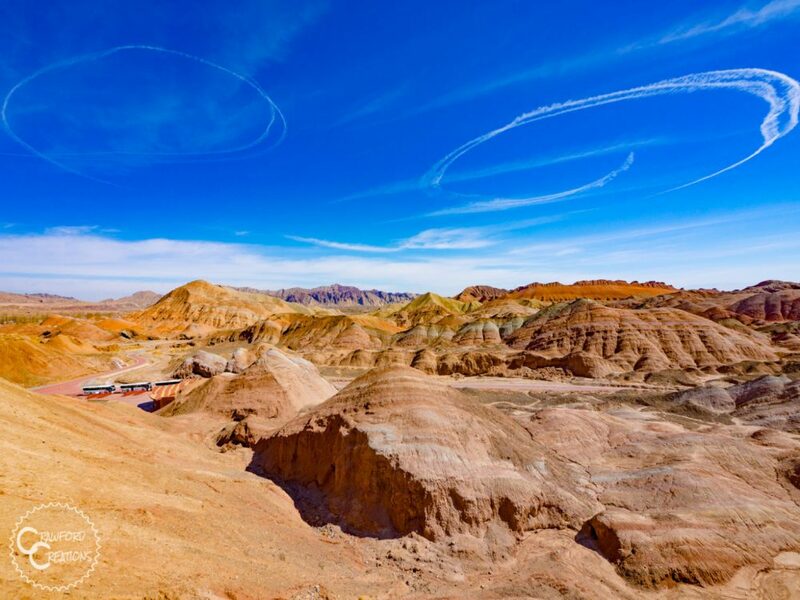 You will most likely have to fly into Jiayuguan, a neighboring city 220km northwest of Zhangye. Check the latest prices and flight availability here. Jiayuguan is the city where the Great Wall of China ends, so if you have time you should definitely go see the Great Wall and fort at Jiayuguan (just to name a couple attractions) while you’re in the area. From Jiayuguan your best bet is to take a train to Zhangye. Trains leave from the Jiayuguan train station heading to Zhangye approximately every hour. You can check train schedules on Ctrip here, or download the China Trains app on your phone. There is no need to book your train tickets ahead of time unless you are traveling on a holiday. As this area is not a super popular tourist destination (yet), we had no trouble showing up at the train station and buying a ticket for the next scheduled train to depart. We never had to wait more than an hour to get on a train. There are two different trains that run between Jiayuguan and Zhangye leaving from two different stations, a high-speed train and a slow train. The high-speed train departs from Jiayuguan South Station and arrives at Zhangye West Station 1.5 hours later. The slow train departs from Jiayuguan Station and arrives at Zhangye Station 1 hour and 45min – 2.5 hours later depending on the train. Ctrip will tell you how long the ride is on their website. It’s almost double the price to take the high-speed train, 65rmb for the high-speed train vs. 37rmb for the slow train with an allotted time savings of only 15 minutes. Check Ctrip or the China Trains app for times, prices, and station locations to figure out which train you want to take and where it leaves from. The park is located 30km west of Zhangye City in a very rural area with literally nothing around. As a result, your best bet will be to hire a taxi or car to take you out to the park, wait, and then bring you back to the city once you’re done. If you’re traveling with more than 1 or 2 people this is absolutely your most time and cost effective bet. We had four people, Justin, me, and Justin’s parents, and were able to hire a car to go to the Rainbow Mountains for the day for just 200rmb. It took us 45 minutes by car to get from our hotel in the city to the park. When we arrived at the train station in Zhangye from Jiayuguan, our taxi driver who took us to our hotel asked where we wanted to go the next day and offered to drive us. This happened every place we went in Gansu and was a super convenient way to hire a car to go site seeing. The next day our taxi driver had exchanged his beat-up taxi for a nice new SUV and was waiting outside of our hotel to take us site seeing. Not all of the taxi drivers will be good tour guides though, so you might have to shop around a bit by taking different taxis or asking your hotel to arrange a good driver for you. We had the nicest driver in Jiayuguan, before coming to Zhangye, who took us around to see all the sites, and even stopped on the side of the road for a photo opp in front of some beautiful snowy mountains. Before dropping us off at the train station, he sent us his friend’s contact info via Wechat who works as a driver in Zhangye. 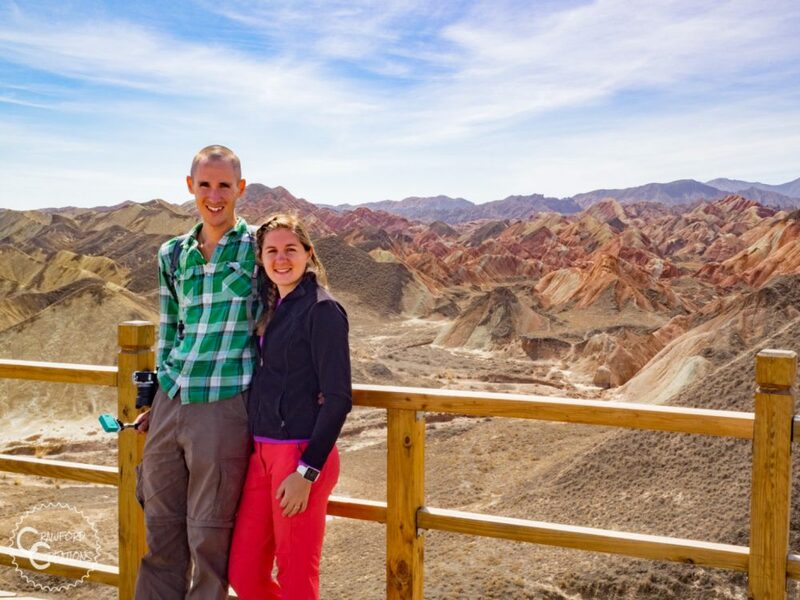 After a bad experience with our driver the first day in Zhangye, we arranged with our Jiayuguan taxi driver’s friend to take us to the Rainbow Mountains. He was so awesome that we then had him drive us around for our remaining 2 days in Zhangye. Awesome people guys, they have awesome friends. As a solo traveler, your most cost-effective option for getting to the park will be to take a bus. Buses depart from the Zhangye South Bus Station and arrive at the park 40 minutes later. Unfortunately, there is no way to check the bus schedule or prices online, so your best bet will be to ask your hotel to call and find out for you. While taking a bus is the most cost-effective you will be sacrificing some flexibility so make sure you find out what times the bus picks up from the park to head back into the city, otherwise, you might find yourself stuck, never a good thing! Included with your entrance ticket is access to park buses that shuttle tourists to each of the 5 viewing platforms around the 8km loop of road. Buses will be waiting just inside the ticket gate. Once at the first viewing platform you are free to roam around and take as much time as you’d like. Don’t worry about sticking with the same bus you got on at the entrance. Buses will come and go every couple minutes. We took an insanely long time at each of the platforms considering it’s not every day you get to see rainbow mountains, and we never once had to wait for a bus. When you first get off the bus the mountains won’t look very impressive. From the ground, it’s hard to see the striations and variations in color. Once you climb up to the viewing platform though, it’s like someone has opened your eyes to a magical world you never knew existed. I swore at times it seemed like we were on another planet. The only time you need to pay attention to which bus you get on is at the last viewing platform. There are 2 lines for the buses, one says North Entrance and the other says West Entrance. Make sure you know which entrance you came in at (there will be a sign at the entrance gate) so you know which bus to get on. Using the park buses is not mandatory. If you get to the park early and plan to spend all day there you could walk the 8km loop to all the viewing platforms if you wanted to. Just know that it will be a long day of walking as you’ll not only be walking 8km on the road, but also climbing lots of steps up to the viewing platforms. Using the buses to travel around the park, and taking our time at each of the viewing platforms put us at around 3 hours of time spent in the park. Keep in mind that we went during the off-season, which is the time when park officials do all their maintenance work. This meant that two of the five viewing platforms were closed when we were visiting in late March. Having another 2 platforms open probably would have put us at closer to 5 hours in the park. Anytime from April – October when the weather is comfortable and the sun is shining. The most vivid colors only appear with the addition of sunshine, so avoid coming on a cloudy day. Winter in Gansu Province is harsh, so it’s not advised to visit too far outside of the April – October range as sub-freezing temperatures, strong wind, and snow will certainly dampen your experience, and may even close the park. There are tons of hotels in Zhangye City, but not all of them accept foreigners. We used Agoda to book our hotels for this trip as it tells you explicitly under each hotel whether or not they allow foreigners to stay, making it really easy for us to know which hotels we should book. This is the first time we’ve ever run into this much of an issue with hotels not accepting foreigners in China. It’s not that they don’t like foreign tourists, but Gansu province is a more remote area of China where not many people speak English. In order for hotels in China to accept foreigners, they need to be approved by the Chinese government. A lot of the hotels in this region of China don’t want the hassle of, first, going through this process, and second, having to deal with people they can’t communicate with and whose standards they don’t understand. See the Rainbow Mountains with your own eyes! The rainbow mountains are the absolute coolest place we’ve been to in China. It’s unique, not overrun with tourists, and an absolute dream to photograph. If we could give you one piece of advice to make your time at the Rainbow Mountains as awesome as possible it’s this, don’t rush! Take your time on each platform and soak in the beauty. This is a landscape like nowhere else in the world, so savor it! I believe they are related. Their names on Wechat are virtually the same. Very good drivers and reasonable price too. This is awesome info. Thanks. Can never be sure if what you see on internet is how it will be or if photoshopped. Thanks Jen! This place is real, no photoshop, but I did edit these photos a little bit to enhance the colors. They’re not quite this vibrant in person. China’s rainbow mountains remain to this day one of the most incredible places I’ve ever been to!